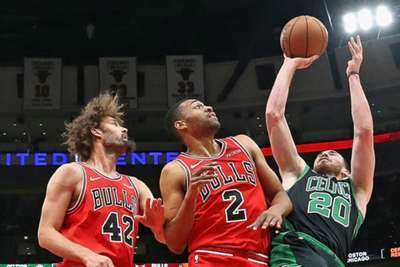 Jim Boylen twice subbed out all five starters because they were "embarrassing" as the Chicago Bulls suffered their heaviest defeat in franchise history to the Boston Celtics. Boylen, who replaced Fred Hoiberg on Monday, changed his entire group on the floor with seven minutes and 15 seconds remaining in the opening period – then did so again with 21 minutes left in the match. The Celtics went on to seal a 133-77 thrashing at United Center, with the 56-point margin representing the worst loss in the Bulls' history. A sullen Zach LaVine hinted Boylen had crossed the line between sending a message to the players and embarrassing them. "We put a lot of hard work into this. I get up, compete every day. I think regardless of whatever the score is, I want to go out there and compete, but obviously we didn't get a chance to do that. I felt embarrassed. I wish I was out there competing," said LaVine. Looking for a much different outcome this Monday. Chicago head coach Boylen had no sympathy, however, directing a clear message to his starting five in a news conference: "I think your play is embarrassing. Me subbing them is saving them, maybe. Maybe we saved them. "The pro player thing, this is basketball; this is about honouring the game and doing the right things. "Embarrassment is not giving the effort in that Bulls uniform, so I put five guys in that I thought could put the effort in. "I wanted to give the other guys a chance to see if they could right the ship a little bit. I've been a part of teams that have done that before; don't like the five guys out here, don't like that combination, look at a new combination, take them all out, let them sit there and think about it. "We didn't honour the game very well with our effort and our competitiveness, so why not take them all out? We're a team, so sub five guys and see what they can do. "They're disappointed, they feel bad about it. We need some leadership to step up, we need some guys to take leadership roles on the team."